I got it at a place called Green & Baker (formerly known as Cafe Kylemore) located on the second floor of Stephen’s Green Shopping Centre at the top of Grafton Street, where face-painted Dubliners were already roaming wild at noon. Gliding up the escalator I was disappointed for only a moment that we would be eating in the food court of a shopping mall. I remembered my last trip to Ireland six years prior and the sumptuous full Irish breakfast I wolfed down at the stately and elegant Bewley’s on Grafton Street (now closed). Somehow a fast food version just didn’t seem as good. That all changed when I saw the selection, and the kindness and patience with which the lady behind the counter scooped things onto a plate. Everyone in line was local and a regular; not a single tourist in sight. 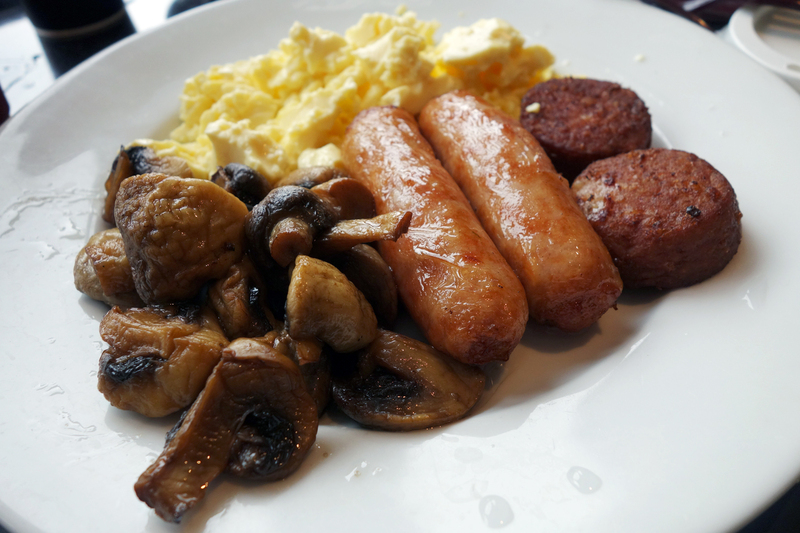 A full Irish breakfast is for me a quintessential part of any trip to Dublin. Besides the obvious cliche it’s something that folks there actually eat. 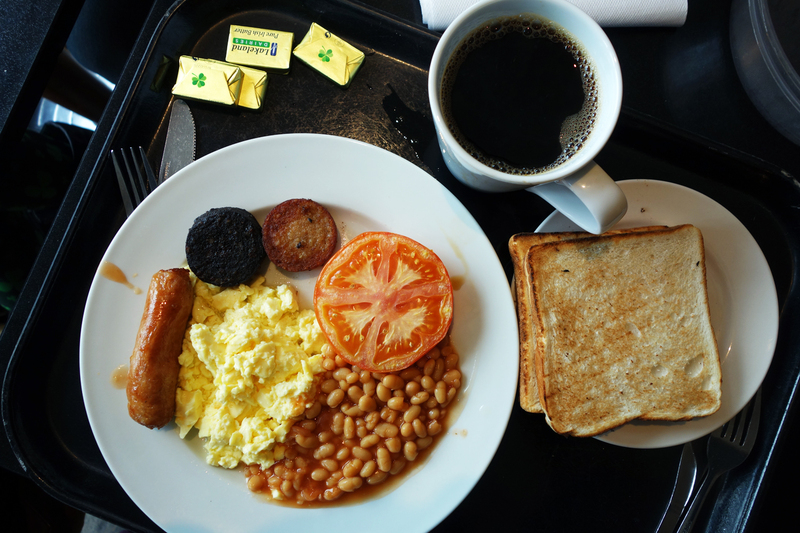 I didn’t come across too many individuals devouring bowls of corned beef and cabbage or shepherd’s pie, but I did see many elegant restaurants and more accessible fast food eateries that offered Irish breakfast combos. This daily staple has, in fact, adapted to the modern Dubliner’s on-the-go lifestyle with what is called the Irish breakfast roll. 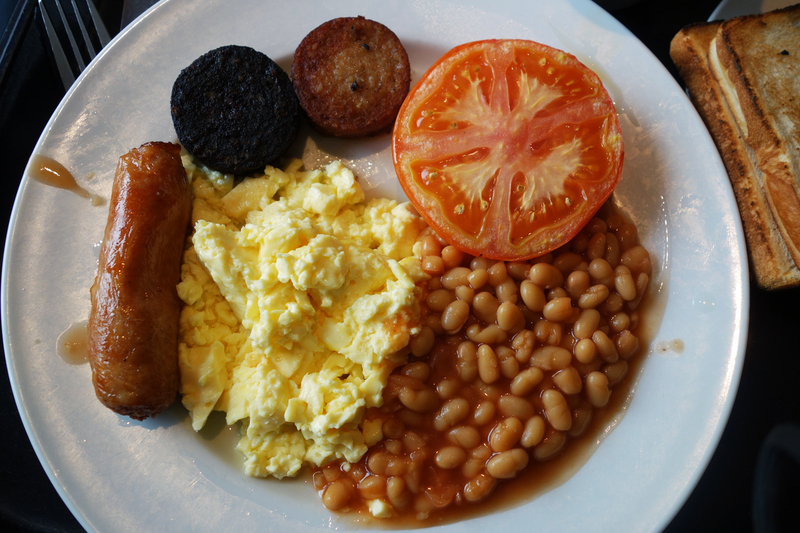 This is basically all the traditional ingredients of a full breakfast plate (two eggs any style, beans, Irish bacon, sausage, white & black pudding, hash brown) between two slices of toasted or un-toasted baguette. I got one of these six years ago on my last day in Ireland, ate it too fast on the bus to the airport and felt bloated during my entire flight home. But it wasn’t bad, otherwise. Green & Baker far surprised my expectations for shopping center food-court fare. Though the food came from a DIY assembly line, plates were of china and silverware of metal instead of plastic. Ingredients were cooked well and my combo was customized, allowing me to pay for only the ingredients I wanted. Guests sat near the windows of Stephen’s Green and spent their time to enjoy their food with a fantastic view of Grafton Street under the centre’s glass dome. This is not fast food; it just happens to be in a mall. And, ironically the experience is way more authentic than a €20 plate at some grungy Irish tavern. March 27, 2015 in DUBLIN.